"In the mood for a bit of something green and leafy? 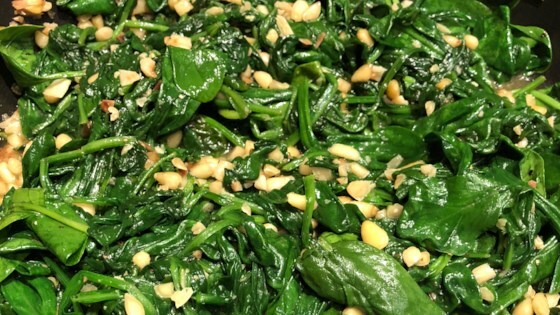 Try this scrumptious spinach with pine nuts. Preparation time: 10 minutes. This recipe is from The WEBB Cooks, articles and recipes by Robyn Webb, courtesy of the American Diabetes Association." I've made a similar recipe before with one variation: I toast the pine nuts in the oven before adding them to the spinach and garlic...everybody loves it! Love this, but we ALWAYS add raisins (equal amount to pine nuts). Raisins, pine nuts and spinach were made to go together. Good recipe, easy to make. I used frozen chopped spinach and it worked well. My family loved it. Thought the recipe could use more garlic though. I never thought I would eat spinach .. this recipe has changed my way of thinking! I love spinach and pine nuts. This recipe is delicious! My kitchen smelled great after making it. Very good. A nice way to use up lots of spinach fast. We served this as a side with lasagne, and sprinkled a bit of romano and parmesan on top. Thanks for sharing a simple and tasty recipe!